Take Highway 400 into Toronto, exiting onto Highway 401 West. Continue until you reach Highway 427 southbound. Follow Highway 427 to downtown via the QEW/Gardiner Expressway. Exit onto York/Bay St. take York St North and turn left onto Bremner Blvd. 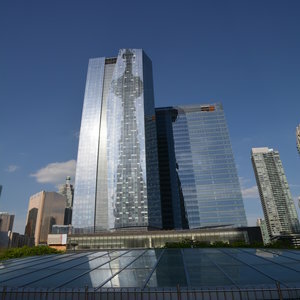 Located in the heart of Torontos new Southcore neighbourhood, the hotel will connect people with the financial and entertainment districts through direct access to the PATH, Union Station, Metro Toronto Convention Centre, Ripleys Aquarium, Rogers Centre, and the Air Canada Centre. The hotel is minutes away from the Toronto City Centre Aiport, revitalized waterfront and Torontos downtown shopping. Take the QEW - Toronto, where it turns into the Gardiner Expressway. Exit onto York/Bay St exits. Take York St North and turn left onto Bremner Blvd. Take Highway 401 East to Toronto and exit onto the Don Valley Parkway Southbound. As you approach Downtown, this will turn into the Gardiner Expressway. Exit at York/Bay St. North and turn left onto Bremner Blvd. Take the QEW - Toronto, where it turns into the Gardiner Expressway. Exit onto York/Bay St. Take York St North and turn left onto Bremner Blvd.